This product is a suspension of affinity purified anti-GFP antibody (ab6556) covalently linked to sepharose beads. It is reactive against all variants of Aequorea victoria GFP such as S65T-GFP, RS-GFP, YFP, CFP, RFP, and EGFP. The unit sold contains 25µg of affinity purified rabbit anti-GFP IgG cross-linked to 125 µl sepharose beads in a total volume of 250 µl buffer. The product is supplied as a 50% slurry to facilitate pipetting. Pipetting the slurry is facilitated when pipet tips are blunted by cutting 3-5mm off from the tip. This product should be kept refrigerated at all times whilst in short term storage. Using sterilised equipment will reduce the risk of bacterial contamination. Our Abpromise guarantee covers the use of ab69314 in the following tested applications. We rountinely recommend using 20 µL of slurry per IP, which corresponds to 2 µg of IgG cross-linked to beads. this results in a clearly visible 10 µL bead pellet upon centrifugation. Unconjugated version: ab6556. FITC conjugated version: ab66180. Biotin conjugated version: ab69313. Immunoprecipitation: COS 7 cell lysates containing 100 ug of total protein in 200 ul of 0.1% SDS-RIPA buffer with addition of complete protease inhibitor were used for each immunoprecipitation. Cell lysates were incubated with anti-GFP sepharose beads for 2 hours at 4oC with rocking. Beads were washed. Proteins were eluted with 1% SDS 50 mM HEPES (pH 7.4) at 80oC (15 min). Half of the IP sample was loaded on each lane of 10 % SDS PAGE gel and gel was processed for Western blotting/ECL. Do you have data on amount of antibody that binds to GFP? Due to the very high titer, assume near stochiometric binding: 1 nmole antibody will bind 2 nmole GFP. For example, 150ug antibody (since M.W. 150kDa) will bind 50ug GFP (since GFP M.W. ˜25kDa and IgG have two Fabs). how much of volume should I take to make aliquot of this antibody (ab69314- 0.1mg/ml in 250ul of buffer) ? We typically recommend using 20ul of slurry per IP. Taking into account this volume as well as the number of IPs you expect to conduct at any one time should give you a good idea of what volumes to make your aliquots. Our customer intends to use ab69314 in IP and she wonders in regards to the protocol details. Is it possible to receive some protocol? Do you recommend to use wash buffer firstly with low pH and then with high pH in order to wash unbound ab from the beads? The exact protocol will vary and depends on the expression level of the GFP fusion and the type of protein and the purpose of the experiment. The full protocol can be found in Megan C. Yap*#, Morris A. Kostiuk*, Dale D. O. Martin, Maneka A. Perinpanayagam, Pieter G. Hak, Anjaiah Siddam, Janaki R. Majjigapu, Gurram Rajaiah, Bernd O. Keller, Jennifer A. Prescher, Peng Wu, Carolyn R. Bertozzi, John R. Falck and Luc G. Berthiaume (2010) “Rapid and selective detection of fatty acylated proteins using omega-alkynyl-fatty acids and click chemistry” J. Lipid Res. 51:1566-80. Cells ( 1 °— 10 6 to 1 °— 10 7 ) were washed with cold PBS, harvested, and lysed with cold EDTA-free RIPA buffer by rocking for 15 min at 4°C. Cell lysates were centrifuged at 16,000 g for 10 min at 4°C and the postnuclear supernatants were collected. GFP fusion proteins were immunoprecipitated from approximately 1 mg of protein lysates (depending on the expression level of the GFP fusion larger amount of lysate may be needed) with affinity purifi ed goat anti-GFP cross-linked to Sepharose beads by rocking for 2 h or overnight at 4°C. 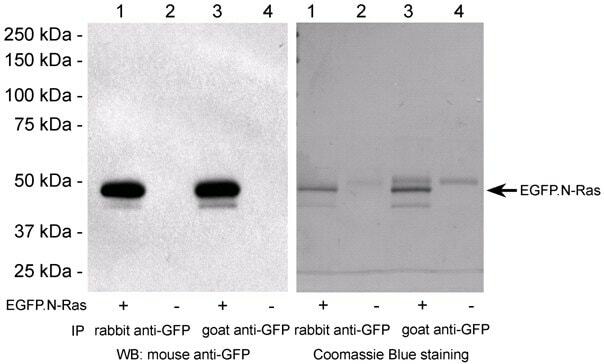 ...the rabbit anti-GFP-sepharose sold by Abcam can also be used. in 50 mM HEPES, pH 7.4, with 1% SDS containing buffer or any standard SDS-PAGE loading buffer depepnding on the application or purpuse of the experiment, and heated for 15 min at 80°C (or 5 min at 95C or 2min at 100C (again depending on the application).
. The supernatants containing the fusion proteins were collected. Please note that this would be a guideline only and may require some individual optiization. I am planning to use anti-GFP antibody conjugated to sepharose (your ab69314) for immunoprecipitation of mammalian cell lysates. Can you tell me whether this product is compatible with the following detergents: 2% CHAPS and 1% NP-40, 0.5% sodium deoxycholate (RIPA buffer)? ab69314 is 100% compatible with the detergents that you mentioned. Do you know whether this product was used for co-IP of plant proteins. Any references? I performed a test today with 100ug of protein. I was surprised that the beads are hardly visible. I am used to prot. G-sepharose beads and they are more visible than the GFP-Sepharose. Is that normal? As it is difficult to see them I am worried I don't get the IP protein or inespecific proteins are also there. Let me know when you have time if that is normal. The beads can appear to be translucent white when in the slurry. This is normal.Before taking out beads from the stock solution, it is important to mix the slurry well. After the IP, when pelleting the bead-antibody-protein complex, the pellet should be clearly visible and stable so that the supernatant can be taken off without any bigger difficulties. Please let me know how the results is looking on the WB. I am happy to help if optimisation is need. I am going to do an IP next week with your product ab69314. My plan is to process the acrylamide gel with comassie for excision of the bands and analysis by MALDI-TOF. Because of that I need as much protein as possible. I am planning to immunoprecipitate 3mg of my protein extract. How many ul should I add of ab69314 for that?. Datasheet recommends 20ul per IP but your example is performed with just 100ug and I don't know if with 3mg it is going to be the same. On the other hand can the elution be performed at 95ºC for 5 minutes? Can this elution be performed with the loading buffer sample 5x (Tris 60mM, glicerol 25%, SDS 2%, Bmercaptoethanol 14.4mM, Bromophenol Blue 0.1%) so it is ready to load? I recommend to test-run a smaller sample first. I can recommend to use 20ulslurry (2ug of IgG cross-linked beads)with 100ug protein and check the result. If this works optimal with your samples, I then can recommend to scale it up. Since 3mg would mean 600ul slurry, I can recommend to optimise further. Maybe 250ul slurry will be enough (this is one vial of ab69314). I am sorry I do not have a definitive answer to this question. This has not been experimentally tested by us and we therefore cannot recommend any definitive amounts. I can confirm that elution of the protein after IP can be done by boiling in loading buffer. 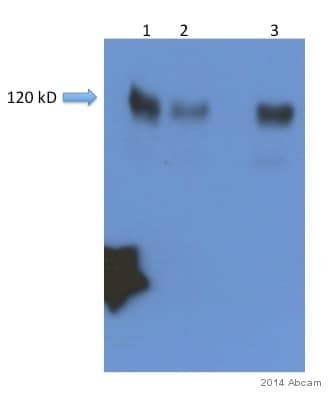 This will most probably also detach some of the IP antibody from the beads (althoughantibody and beads are covalently bound)and therefore there is the risk of getting heavy and light chains of the IP antibody into the gel. Please check with your MALDI-TOF protocol for requirements on IP and gel run. . I have some questions about this antibody. How much GFP could be combined to the cross-linked IgG for 20µl of slurry per IP? What is the condition to elute combined protein off beads ? I also want to know the how strong the conjugation is between antibody and sepharose? When protein is eluted, will the GFP antibody also be eluted off the beads? Replies to your questions: 1. 10ul Beads (20ul slurry) will contain 1ug IgG, each IgG (MW:150,000) can bind 2 GFP molecules (~MW:25,000 each ), therefore about 666ng of GFP should bind to these beads. Cross-linking should not interfere too much with the binding. 2. Proteins were eluted with 1% SDS 50 mM HEPES (pH 7.4) at 80oC (15 min). 3. The cross-link was carried out by a proprietary process that should minimize leaking of both IgG heavy and light chains. Typically less than 5% of the IgG content on the beads will leak. 4. By boiling samples there is a risk of having the antibody eluted too, therefore a mild eluent, such as glycine buffer, should be used to avoid this from happening. Which antibody is better (stronger) for IPing a sample with low quantities of GFP? Thank you for your inquiry. Both antibodies will work quite well actually, but we would recommend the antibody cross-linked to sepharose-beads (ab69314) simply because the lab worked with it for a much longer period of time than the antibody cross-linked to magnetic beads (ab69315). I would recommend our rabbit-anti-GFP-crosslinked to sepharose beads for the IP, then use Ab290 or Ab6556 for the WB. If the GFP concentration is really low, you may want to increase the volume of the sample by making more of it. Our IP protocol worked just as well in 1ml or 10 ml because of the high avidity of the antibody for the antigen. Incubate sample with the antibodies for 2-4 hours at 4C. Keep the amount of beads low and centrifuge thoroughly to increase beads recovery. If you incubate overnight make sure you have protease inhibitors in the lysates. I hope this information helps. Please contact me with any other questions.